For the first time since 2010, the police have acknowledged that five foreign men working in Israel were victims of human trafficking for enslavement. The police have opened three criminal investigations against their employers, suspected of holding them in prison-like conditions and coercing them to work without compensation. All five men, who hail from Asian countries, have been placed in shelters. Police are currently investigating the circumstances under which the five were trafficked into Israel, who paid for them, and who took away their passports. The probes have been going on for months. The police recognized the men as victims of human trafficking after discovering “preliminary evidence” confirming that the five were held in conditions of slavery following their being brought to Israel. The maximum punishment for such a crime is 16 years in prison. One of the cases was revealed a few months ago when the victim, a worker from Thailand, was found at a gas station in the south of the country in serious condition. The two other cases were brought to the attention of the police by social welfare organizations. 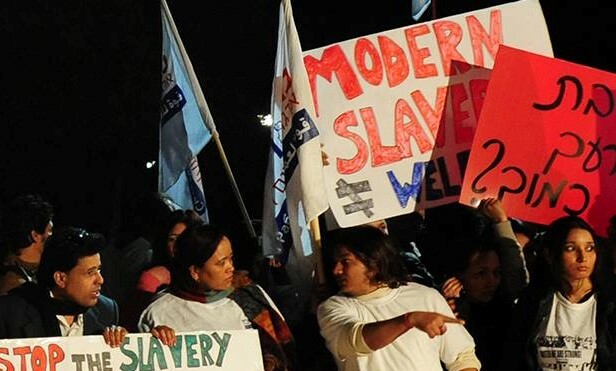 Despite the fact that the acknowledgement of men as victims of human trafficking is rare, workers’ rights groups say the five are represent just a small number of the many thousands of cases in which foreign workers are employed in agriculture in Israel under similar conditions. “In addition to praising what seems to be the beginning of the authorities’ work to identify the victims of modern slavery in Israel, we are also very concerned that these five acknowledged cases are not rare or extreme examples, but rather represent a very widespread phenomenon,” Michal Tadjer, an attorney with rights group Kav La’oved – Worker’s Hotline, told Haaretz. Workers’ rights groups have continuously and repeatedly attacked the Interior Ministry and its Population and Immigration Authority, complaining about the lack of government supervision in the area of agricultural employment. Kav La’oved estimates that about 25,000 workers from East Asia are employed in agriculture in Israel, most of them from Thailand. The organization accuses farmers of providing harsh conditions for employees, paying less than the minimum wage, and taking advantage of the workers’ poor Hebrew to withhold information from them about their rights.